Two friends, Sue Conley and Peggy Smith have earned their stars in some of San Francisco's most famous kitchens, like Chez Panisse, and Bette’s Oceanview Diner in Berkeley, but in the early 1990s, they were ready for a new challenge; a cheese making company. They found it in Pt. Reyes Station, a picturesque postage-stamp-of-a-town on the coast about an hour north of San Francisco. This first location, a renovated hay barn in downtown Point Reyes, featured a small cheesemaking room at the entrance to the building. It gave them ideas. Using milk from neighboring Straus Family Creamery, they began making delicious fresh cheeses. Legend has it that when Peggy and Sue were exploring names for their budding cheese business, two women on horseback pulled up in front of the barn, hitched their horses to the bike rack and ran into the grocery store for supplies. Ellen Straus, who was visiting at the time, looked at Sue and Peggy and said: 'We’re living in the Wild West out here'. Peggy’s response: 'Then we must be cowgirls! 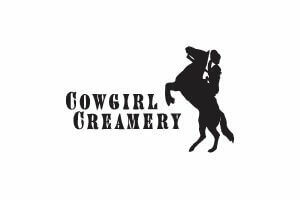 and this must be the Cowgirl Creamery'. At the start Cowgirl Creamery's goal was to make wonderful, fresh, organic cheeses – cottage cheese, creme fraiche, fromage blanc, and quark, later aged and soft-ripened cheese were developed.